DoorBot is a simple idea, a smart doorlock that you can control wirelessly, but also with a camera to see who’s at the door, and the capability to talk to them wherever you are. Not just that, the DoorBot is designed to work with Lockitron, a system that will allow to also open the door remotely for strangers. It’s still an idea, though, and one that needs funding. With a $250,000 funding goal, the project has already raise more than $15,000, and it is doing so not on Kickstarter, but on an independent website. $169 will get you the DoorBot system, and for $319 you’d also get the Lockitron system for locking and unlocking the door remotely. Simplicity is the key to how it operates. It simply attaches with four screws and runs on four AA batteries that should last you a year of regular use. The camera has infrared so it will work during nighttime as well, but there are no details on the actual resolution. You can back the project at the source link right below. Already a lot of products that can do this...maybe not as a single unit. The big name now is 2GIG that also connects through alarm.com to control doors, security system, and home automation. 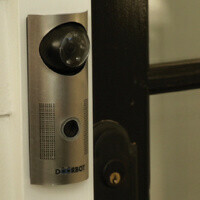 DoorBot with Lockitron? Do they 'fight for the user'? I knew I remembered seeing a similar product on Shark Tank. I don't remember it having a camera, but there seem to be a lot of ideas like this one coming up now.